Despite substantial economic challenges, Zambia has successfully scaled up interventions across the three diseases. Nevertheless, issues concerning the capacity of health workers and the capacity of diagnostic systems have negatively impacted service delivery. As well, there have been delays in the implementation of program activities –– such as multi-drug-resistant TB treatment, mosquito net distribution and indoor residual spraying. These are the main conclusions of an audit by the Office of the Inspector General (OIG) of Global Fund grants to Zambia. A report on the audit was released on 22 December. Zambia is a lower-middle-income country with a population of 16.2 million. Zambia was ranked 139th out of the 188 countries in the UNDP’s 2016 Human Development Index; and 87th out of 176 countries in Transparency International’s 2016 Corruption Perceptions Index. Despite fiscal constraints, Zambia’s health budget has seen significant investment, increasing by 150% in the last six years. This represents 8.3% of the 2016 total national budget, down from 9.6% in 2015. Almost 60% of the health budget is spent on salaries, which reduces available resources for programs. Politically, Zambia has had a decentralized structure since 1991 with 10 provinces and 103 districts. The Ministry of Health (MOH) retains policy setting, planning and coordination, and management roles. Service delivery is devolved to the district level. 1. All grants had an end date of 31 December 2017 except the UNDP grants which was on a six-month non-costed extension. 2. Only the MOH and CHAZ grants were included in the audit. The audit covered the period January 2015 to May 2017. The OIG stated that a decline in government funding has created a heavy dependence on donors for the delivery of programs. There are challenges concerning the government’s coordination of donor activities, resulting in gaps and potential duplication of activities, it added. Finally, although the availability of routine and survey data for decision making has improved, the OIG said, inaccurate recording and reporting compromise its reliability. Table 2 lists the three areas assessed in the audit, the OIG’s ratings and its summary comments for each area. AREA 1: The adequacy and effectiveness of processes and controls of funded interventions for the delivery of quality services to intended beneficiaries. OIG comments: Although investments made have supported the scale-up of interventions across all three diseases and improved retention of patients on anti-retroviral treatment, there are service delivery issues in diagnosis and monitoring of patients on treatment. Program effectiveness has been impacted by low TB case notification, delayed implementation of HIV prevention activities and malaria vector control interventions. AREA 2: The effectiveness of supply chain management systems in availing and accounting for quality-assured medicines and health products in a timely manner. OIG comments: Although significant improvements are already underway, last-mile distribution arrangements and accountability of medicines are yet to be addressed. Varied magnitude of stock-outs and expiries of health products were identified across the supply chain. AREA 3: Availability of accurate and timely data to aid decision-making. 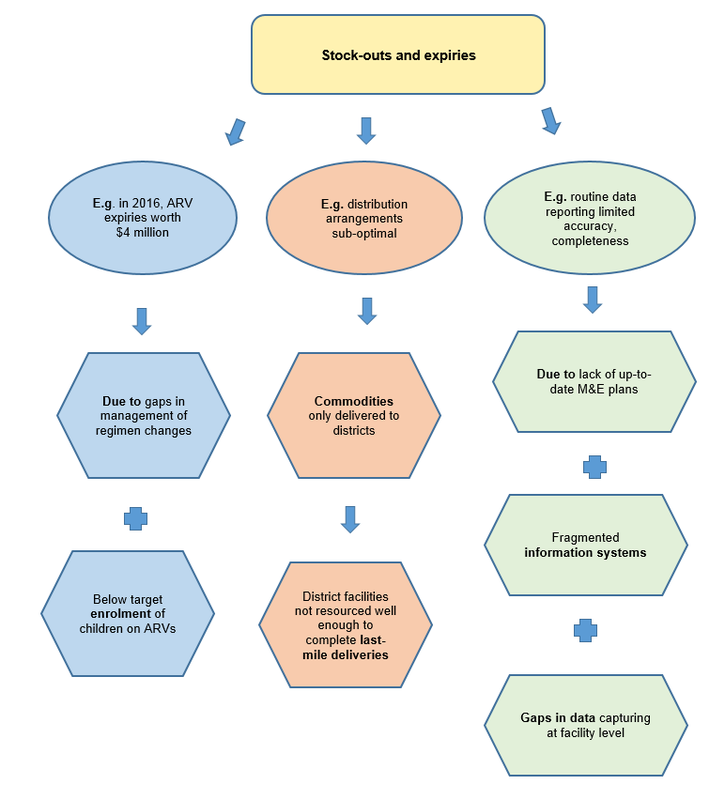 OIG comments: The completeness and timeliness of routine health information data quality continues to improve; however, data challenges remain with limits to both the accuracy and completeness of HIV, TB and malaria data at the service delivery level. Continued efforts are required to integrate data systems with multiple fragmented patient information management and reporting systems in place. Progress in meeting targets. The number of new HIV infections fell by 29.4% from 85,000 in 2004 to 60,000 in 2015. Just under 89% of people living with HIV aged 15–50 have suppressed viral loads. TB incidence fell by 40%, from 650 per 100,000 population in 2003 to 391 per 100,000 population in 2015. Malaria deaths decreased by 70% from a baseline of 51.2 per 100,000 in 2010 to 15.5 per 100,000 in 2015. Country policies aligned to latest guidelines. Zambia’s policies follow the latest diagnosis and treatment guidance from the World Health Organization (WHO) and UNAIDS. 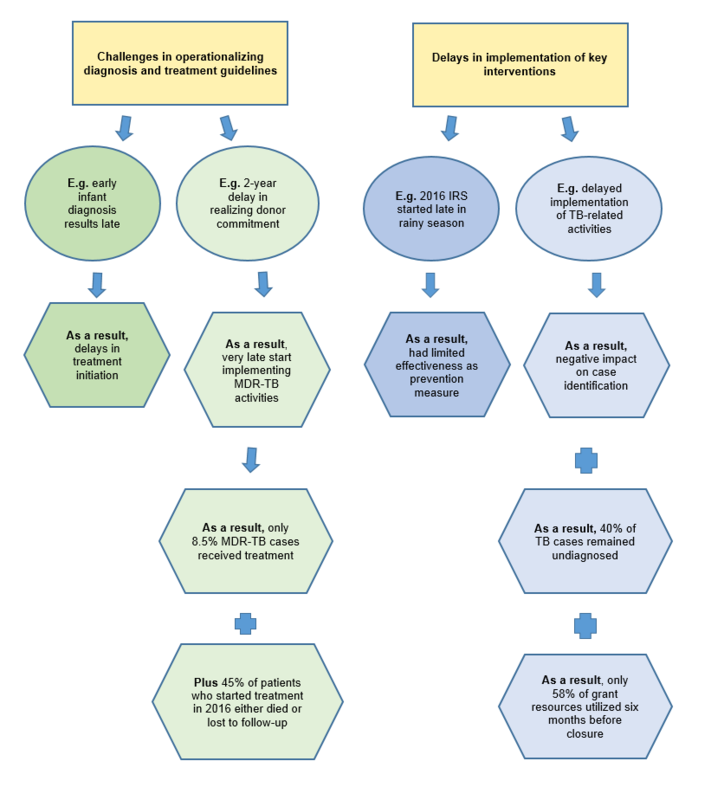 These include (a) changing eligibility criteria for treatment from CD4 count 350 to 500, and now to test-and-treat; (b) universal treatment for life for expectant mothers living with HIV, regardless of their CD4 count (known as option B+); and (c) adopting the 90-90-90 targets. Changes in the management structure of the grants. The management of the government grants has reverted from the UNDP to the MOH. The Churches Health Association of Zambia (CHAZ) contract was renewed; and CHAZ took on a previous Zambia National Aids Network (ZNAN) grant and part of the Ministry of Finance’s grant responsibilities. Achievement of impact was adversely affected by limitations in the quality of services and delayed implementation of key interventions. Country systems have not evolved at the same pace as program scale-ups. Leadership and program oversight need strengthening. Below, we examine each of these areas (partially through the use of diagrams). People with HIV are not consistently monitored. Zambia has made progress in the implementation of viral load monitoring since it was first introduced in 2013. Coverage at a national level has increased from 5% in 2015 to 30% in 2016, although this fell short of the 2016 target of 52%. In the 30 facilities visited by the OIG, only 26% and 43%, respectively, of people initiated on antiretroviral treatment (ART) in 2016 had a viral load and CD4 count test done. The failure to undertake viral load testing is attributed to problems in collecting, processing, transporting and communicating results, as well as the sub-optimal use of available viral load equipment. Grant funds have been provided for the establishment of a routine system to monitor resistance to antiretrovirals (ARVs) and to manage people identified as drug resistant. However, at the time of the audit (six months before grant closure), this system was yet to be established. Problems in infection control and prevention of TB transmission among people living with HIV. National guidelines recommended isoniazid preventive therapy (IPT) for people living with HIV who were on ART and who were TB-negative. However, the implementation of this guidance has been adversely impacted by the limited availability of medicines and the reluctance by clinicians to implement. Only 15% and between 23–25%, respectively, of people with HIV received IPT in 2015 and 2016. Only 28% of the 30 facilities visited had provided IPT in May 2017. In addition, of the facilities visited by the OIG, 37% did not have a designated isolated area where patients can produce sputum specimens for TB diagnosis; and 87% did not have masks in stock. These gaps in the provision of IPT could create an environment conducive to the spread of TB in health facilities among patients, health workers and the general community. Limitations in the implementation of prevention interventions. Progress has been affected by (a) limited implementation of activities related to key populations; and (b) failure to reach male circumcision targets. Funding in the amount of $2.0 million was allocated to the National AIDS Council (NAC), a sub-recipient of the MOH, for implementation of key population work. Aside the mode of transition survey for which results were pending, other planned activities for 2015 and 2016 related to removing legal barriers to access remained outstanding at the time of the audit. The delays in this area are due to the slow set up of systems by the NAC’s civil society sub-contractor. Circumcision rates have improved since the beginning of the grants, but they remain behind target with only one million out of the 1.9 million (54%) circumcisions planned for 2012 and 2015 undertaken. Low implementation to date is, in part, attributed to unrealistic targets set during the first year. These targets did not adequately reflect the requirements for demand as well as the need to build the capacity of health facilities to undertake circumcision according to national policies and standards. In addition, voluntary medical circumcision was hampered by limited resources (staff, finances and infrastructure) to support the planned scale-up. Delays in the implementation of key vector control interventions. While in-patient malaria deaths per 1,000 decreased below the target in 2016, the number of malaria cases in the same year went up by almost one million cases. This has been attributed to a number of factors including improved reporting by health facilities; detection bias due to an increase in community-based services through a scale-up of integrated community case management (iCCM); unusually heavy rains; and problems in planning for indoor residual spraying and bed net mass campaigns. Bed net distribution was delayed by two months due to gaps in documentation submitted by implementers, which postponed the release of funds. This adversely affected key related activities such as printing guidelines, training stakeholders, prepositioning bed nets for distribution, and planned social behavior change communication activities. At the time of the audit, planning for the next mass campaign was underway and late and catch-up plans had also been prepared to keep the campaigns on track. However, no provision had been made for buffer stocks for the campaigns. As a result, bed nets meant for routine distribution to key vulnerable populations have had to be reallocated to the mass campaign. Indoor residual spraying took place late, either during or after the rainy season. This resulted in a 32% rejection rate by people who refused to have their houses sprayed due to the inconvenience of having to take out the furniture during the rainy season. The OIG said that leadership and government ownership is achieved by developing strategies to provide guidance on the interventions that should be prioritized. However, the OIG said, because these strategies are sometimes not implemented, and because of limited donor coordination by the government, there are gaps and potential duplications in donor-funded interventions. Further, the OIG stated, the oversight function of the country coordinating mechanisms (CCMs) has not supported processes to solve key program risks. Concerning the last point, the OIG reported that the CCM has instituted governance structures to support its key responsibilities related to the Global Fund program. However, the effectiveness of these structures is negatively impacted by low meeting attendance from key stakeholders such as the MOH whose delegate only attended four out of the 12 meetings held between 2015 and 2017. In one meeting, the OIG noted, decisions had to be revoked due to a lack of the requisite representation. Furthermore, 44% of oversight meetings held between 2015 and 2017 did not have the required quorum to make decisions. As a result, while key issues impacting the programs were sometimes discussed, no actions were agreed on how to resolve them. The OIG cited four examples of where this had occurred: the lack of donor landscape mapping; inadequate government counterpart funding; delays in procurement processes; and ongoing delays in the construction of regional hubs. See Table 3 for a summary of the four AMAs the Secretariat will undertake to address the findings of the audit.